Trump Tax Returns Discussed By White House Lawyers Democrats point to a 1924 law that allows Congress to request the tax returns of any taxpayer. But Trump and his defenders say the president's returns are private and can't be reviewed by Congress. IRS Commissioner Charles Rettig, making a subsequent appearance before the same House subcommittee, said no one at the tax agency has had any communication with the White House about disclosing presidential tax returns to Congress. Rettig did not indicate whether the IRS would comply with Neal's request by Wednesday. During a later appearance before the House Financial Services Committee, Mnuchin said the Treasury Department would follow the law and cooperate with Congress. "We would not ever ask for the White House's permission on this nor did they give us permission. As I said, we consulted, which I believe was appropriate of our legal department," Mnuchin said. Rep. Carolyn Maloney, D-N.Y., said the department's communications about Trump's tax returns were "deeply troubling" and violated "the spirit of the law if not the letter." But Mnuchin insisted that he would protect the Treasury Department's independence on the tax return issue. "I'm not afraid of being fired at all." President Trump has turned away all requests that he voluntarily disclose his taxes, as other recent presidents have done. Democrats contend he is withholding his returns to hide financial details that could lead to political or legal problems. The Trump administration and its allies have launched several counterattacks. GOP members of Congress have sought to give the administration cover by casting the request as politically motivated. 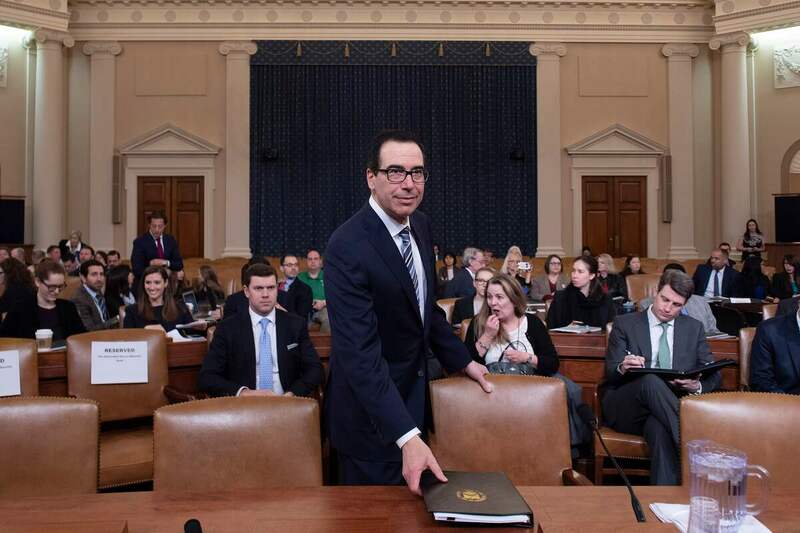 "It seems like we have a chairman and potentially a party that is attempting to weaponize the IRS for political gain," said Rep. Tom Graves, R-Ga. But George Yin, a tax law professor at the University of Virginia, said past case law should give the administration no leeway. "The provision does not give any basis for the secretary of the Treasury to refuse the request," he said. The provision dates to 1924, when Congress was investigating scandals from the administration of President Warren G. Harding, who had died the year before. Among the scandals: Millionaire banker and investor Andrew Mellon had held on to investments when he became Treasury secretary and had allegedly used inside information to profit. "The parallels between what happened that led to the creation of this law in 1924 and today's circumstances are really very close," Yin said.